Address: 101 E. Dare Dr.
Sun Kissed is a great family beach home that provides a comfortable, cozy atmosphere along w/ an Oceanside location that is very close to the beach (approximately 370 ft. to Beach w/direct access), that will keep you coming back year after year. Peacefully situated in South Nags Head, you're sure to enjoy the quiet setting & convenience to local shopping & dining. This home has direct access to the Beach w/ no roads to cross & there is a bike path/sidewalk that runs throughout Nags Head. Ground Level: Parking for 4 Cars, Steps to Entry, Laundry Area, Enclosed Outside Shower, Picnic Table, & Park Grill. 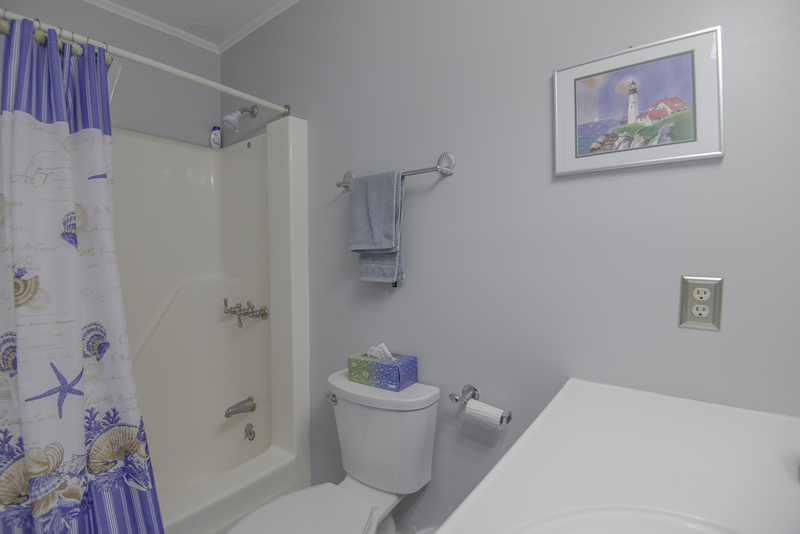 Main Level: Living/Dining/Kitchen, TV, VCR, DVD, Tapes, Games, DVD's, Tile Floors, 4 Bedrooms (Master Suite w/King, TV, & Full Bath, 1 w/Queen, 1 w/Duo Bunk w/Trundle, & 1 w/2 Singles), Full Bath, & Sun Deck. Features Include: C/AC & Heat, Washer/Dryer, Dishwasher, Microwave, Ice Maker, Phone, 2 TVs, VCR, DVD, CATV/VCR Combo, DVD/VCR Combo, Stereo, Wireless Internet, Ceiling Fans, & Baby Equipment (High Chair& Port-A-Crib). No Pets. This is a Non-Smoking Unit. I was very happy with the house. The house was spotless and the decor was great. Great location to the beach. I will be returning next year. Our family had a pleasant stay at Sun Kiss. The house is nicely decorated. We found out that the short walk to the beach was not as bothersome as I thought it would have been! A beautiful home. The shower on the bottom level helps keep the house clean...great feature!! Nice clean house, right down from the beach. Beautiful home with all the amenities we were looking for. Perfect size for the amount of people that we had. We will definitely look to rent it again next year if we have the same amount of people. We miss the house already! We truly enjoyed our stay. This is our 15th year coming to the OBX and we can't wait for next year. Beds were very comfortable and the house had everything we needed.